As a leader, can you identify key organizational problems, but you’re not always sure how to solve them? We work with a team of your best managers and employees to understand the current work process, analyze it, complete process modeling and then reengineer the business process. Our proven methodology energizes and leads them to inventive ideas that really get implemented in the work place. The team creates solutions based on data and design principles. Their involvement and commitment guarantees a successful implementation. Ideal for leadership development, the team wins by gaining new skills and seeing their low cost business designs profit in the work place. Available Now on Amazon. Click and Buy It! 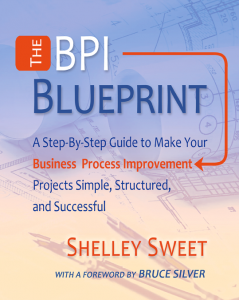 The BPI Blueprint: A Step-By-Step Guide to Make Your Business Process Improvement Projects Simple, Structured and Successful provides you with a detailed plan of action to create results the first time, inspire leaders of business processes, and build invigorated skilled teams. So if you’re looking for a simple, no nonsense, guide to help you develop and manage effective Business Process Improvement projects, regardless of your experience-level, you’ve got the right book. See more on Amazon. Our Action Learning approach has 3 teams work on 3 processes simultaneously each with a sponsor, project lead, and internal consultant. Multiple projects demonstrate business results!